Ra’s Al Ghul is typically one of the more outlandish villains in DC’s stable, even if he’s not one of the goofballs running around in a themed costume and barking orders at similarly themed henchman. Instead, he usually has ridiculously sculpted facial hair, wears a lot of bright green capes, and has a tendency to engage in shirtless sword fights—which is not a euphemism. Also, he’s the head of an ancient order of assassins and is immortal, thanks to the magical healing waters of Lazarus Pit. He’s basically ridiculous, which makes him a perfect fit for Fox’s Gotham. 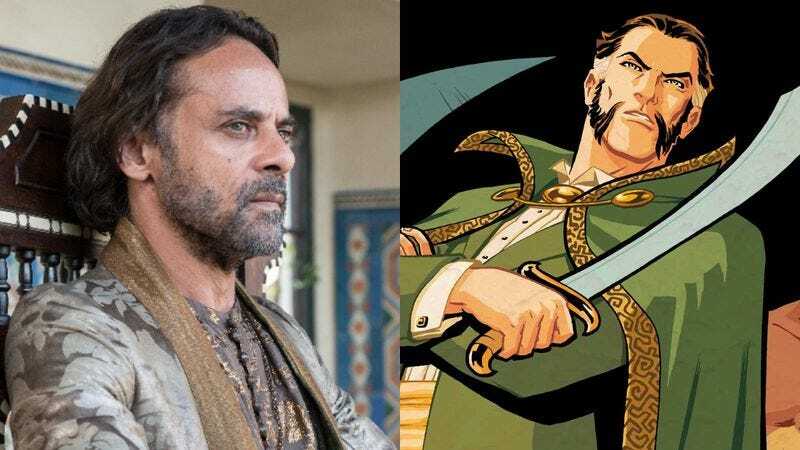 According to Deadline, Ra’s Al Ghul will make his debut on the show at some point after it returns from its winter hiatus, and he’ll be played by Game Of Thrones’ Alexander Siddig. He played Doran Martell on the HBO series, who you might remember as one of the many people in Dorne who did pretty much nothing and then died. We don’t know much about what he’ll do on Gotham, but hopefully it’s a bit more interesting than that. At least we’ll get another chance to hear people pronounce his name, which is always fun. A few seasons ago, Matt Nable played Ra’s Al Ghul on Arrow, and Liam Neeson played him in Christopher Nolan’s Batman Begins and The Dark Knight Rises.